This is the third installment in Carlos Acevedo’s Shoot The Moon series covering the career of Larry Holmes. For nearly two years Larry Holmes, “The Easton Assassin,” had listened, bitterly, to the whispering campaign against him: he had won an off-brand title from Ken Norton; he had thus far failed to live up to the star voltage of his predecessor, the most famous athlete in history, Muhammad Ali; he had defended his ersatz championship against undistinguished Alfredo Evangelista and Ossie Ocasio; he had a growing chip on his shoulder already the size of a Datsun 280ZX. Even with an undercard topped by Roberto Duran-Carlos Palomino, sales were slow enough to virtually guarantee that Holmes would be toiling for arcade money. Down on 42 Street, The Deuce, he could probably rack up a few games of Galaxian or, if he was lucky, he could splurge on Skee-Ball with his limited earnings. 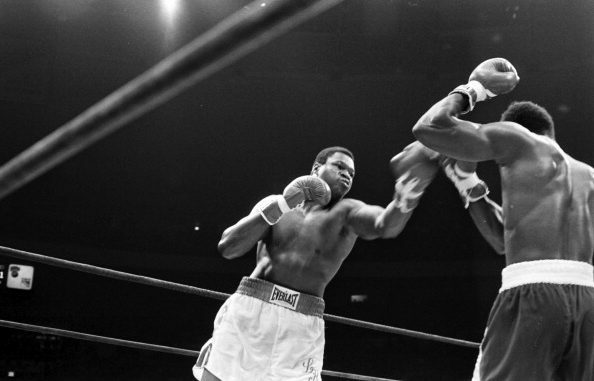 To cash in, Holmes would have to wait for his $3 million showdown against Earnie Shavers, scheduled for September 14. Depending on which bills remained unpaid, Weaver accepted fights with barely enough time to pack his kit. Often, he was overmatched, and in his first years as a knockaround pro he managed the stunning feat of being kayoed by not one but two Bobicks—Duane and Rodney—sibling Great White Hopeless wannabes of the pre-Cooney era. Less than two years after hitting the California circuit (from San Diego to L.A. to Bakersfield and Fresno), Weaver sported a record of 6-6. Mike Weaver was destined to be a loser, and, in boxing, a loser is a man without a shadow. But Weaver discovered ambition when he met a manager with know-how—Don Manuel, who had guided Lonnie Bennett and Eddie “Bossman” Jones to title shots—and a trainer—Ray Barnes—who had once gone the distance with Sugar Ray Robinson. Most important, perhaps, was the fact that Weaver had also become a regular sparring partner for Ken Norton in Southern California. Norton, perennial Ali nemesis and future paper titlist, gave Weaver a nickname, “Hercules,” and more than just a few pointers. With the exception of the cross-arm defense and a footloose style, Weaver modeled his new-and-improved look on Norton. There was the herky-jerky movement, the feints, the leaning out to draw leads, the looping counter right hands. Weaver did not have the natural ability, the athleticism, nor the experience, but he had something even Norton lacked: genuine KO power. By the time Weaver landed his title shot against Holmes, he had amassed a record of 20-8, with 15 kayos. A desperate Don King, recently made unofficial boxing czar of MSG by Sonny Werblin, scrambled, like a man who owed money to a loan shark, in hopes of making ends meet on a promotion that seemed doomed. At the last moment, he convinced HBO, in those days airing only the occasional fight, to broadcast the card for $150,000, what Holmes would later call pocket change. It was hardly enough to make a profit. With the prospect of a red ink threatening to drown him, King went into promotional overdrive. He set up a photo-op for Weaver at the Metropolitan Museum of Art, a recreation of a Rocky Balboa trope—underdog racing up cultural touchstone steps—except with a Beaux-Arts background instead of Greek Revival. For a pop culture tie-in, Weaver repeated, over and over again, the story of how he had seen Rocky ten times and how this Hollywood capriccio had inspired him to overreach. There, cooling off with him in his corner, stood Don King, whom Holmes would blame for both the delay and the financial uncertainty of the whole affair, channeling his inner Tom Wolfe, sporting a garish white suit and bowtie combo not even The Grand Wizard would have worn. King may have been nervous about the box-office till, but he was sanguine about the possibility of Holmes risking a $3 million payday against Earnie Shavers. At ringside calling the fight for HBO were 1940s radio holdover Don Dunphy, ex-newspaperman Larry Merchant, and the worst celebrity mic presence since Burt Lancaster and Jim Brown provided color commentary, Ryan O’Neal. Over the next few rounds, Weaver slipped into plodding, and Holmes rallied, keeping Weaver at bay with his jab and crossing with the occasional right. In an effort to regain momentum, Weaver came out for the eighth with bad intentions. He staggered Holmes early with a hard right, prompting the champion to exhort him for more and initiating a toe-to-toe exchange. The two men battered each around the ring for the next minute or so, with Weaver landing a crashing right hand to end the free-for-fall momentarily. With about a minute to go in the round, Weaver folded Holmes like a pocketknife with a left to the body. While Weaver was still landing serious leather in spots, he was also succumbing, if only by degrees, to the pace. As the grueling rounds went by, Weaver no longer had the energy to bob, weave, and feint, making him an easier target for a Holmes who had been inaccurate throughout the fight. Holmes may have been exhausted, but he still had the edge in talent. All that talent, and all the years of struggle Holmes had gone through, seemed moot when Weaver landed a straight right at the end of the tenth that left Holmes doing an involuntary jig by the ropes. Before Weaver could land the finisher, however, the rounded ended. In the eleventh, Weaver, with his dreams of distinction seemingly in reach, stormed out of his corner with both hands churning. Holmes returned fire, and they whipped bruising shots at each other while the crowd chanted for Weaver. Suddenly, Holmes stopped fighting, pulled away from firing distance, and backtracked, arthritically, into his own corner, where he shot a desperate glance at his trainer, Richie Giachetti. Either Holmes was trying to lure Weaver into a trap, or he was so weary that he simply wanted to end the round as close to his stool as possible. Weaver, sensing victory, pursued Holmes, perhaps with the sounds of “Gonna Fly Now” ringing in his head. Out of nowhere Holmes unleashed a right uppercut just as Weaver was leaning in. It landed with the whipping force of a nunchuck, and Weaver dropped to the canvas in a heap, his right leg empretzled beneath him, a sleepy look fogging his eyes. Shaken, Weaver beat the count and was fortunate that the bell rang before Holmes could follow up, but the one-minute rest period was not nearly enough to revive him. After an extended rally by Holmes, Referee Harold Valan stepped in to stop the fight forty-four seconds into the twelfth. Weaver, who had been pinned, unresponsive, against the ropes, protested mildly. At the post-fight press conference, a weary Holmes, face puffy, eyes bloodshot, lips swollen, seemed at a loss for his performance. “I made a lot of mistakes in the fight,” he said. “I’m not making any excuses. Maybe I took him too lightly. In the future, I’ll be much better. I know how to fight, I know how to win. But I got hit with some shots I wasn’t supposed to get hit with. He hit me with a good right hand in that first round. I admit I was stunned. The only thing I did for Weaver was build up his confidence. Now I’ve got to go back to the drawing board, work on my lateral movement.” Later, Holmes would claim that he entered the ring suffering from the flu, which seemed odd since it was June, long past flu season on the East Coast. He ended his postmortem by announcing that he would not be ready to face Shavers on September 14.